People already share photos of their trips on Facebook, but what if there was a social media site just for sharing travel experiences? Doubletree by Hilton has partnered with Google to create a YouTube channel specifically for the hotel industry. The new YouTube channel, DTour, allows users to post videos, photos or comments on a map on the website. Content from social media sites like Facebook and Instagram can be easily shared in one place so travelers can share with other people who have similar interests. Users on the website can also find travel tips from industry experts. 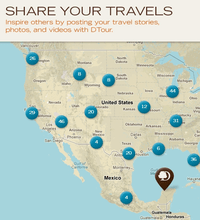 Not only does this help promote hotel brands, but it also allows guests to share their travel stories. Will DTour make a lasting impact or will the current, popular social media sites make it irrelevant?